Five ways to save on lock changes. Pentagon 5-Life Key System dramatically cuts replacement key and cylinder costs while maintaining the highest standards of security and control. And the new key is updated in an instant. Pentagon cylinders can replace any standard cylinder and be fitted to most entrance doors on retail premises. Only the GREEN keys are issued to staff. The others are held by your security department or by Insafe. To change the lock simply insert the YELLOW key and turn. GREEN keys no longer work. No new lock or cylinder. No expensive call-out. No hassle. You start to make savings. By using the WHITE key, both GREEN and YELLOW keys are rendered useless. Security is uncompromised, and more savings made. 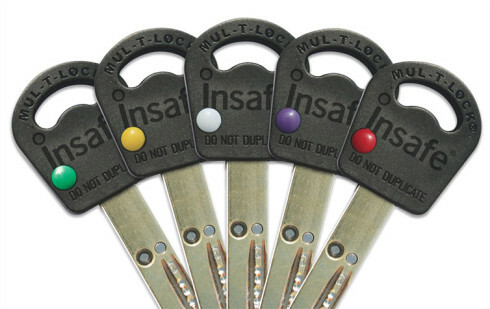 Insert PURPLE key and turn to invalidate all previous keys, and issue new keys speedily at no extra cost. Using the RED key will render all previous keys useless. Security has been continuously maintained and inconvenience minimised. Above all, you’ve saved the cost of four locksmith call-out charges as well as the expense of four sets of hardware. Benefits of Pentagon 5-Life Key System. No need to call out a locksmith. Simply insert the next colour coded key and turn. Replaces all types of standard cylinders. Registered keys cannot be cut without authorisation. High quality design and build for high frequency retail use.